Sorry for the lack of posts here. I have not been going out very much lately, and when I have I have been going to places I have already posted about. Money has been somewhat tight with some travel and a very expensive vet bill. I’ll try to be better, but I can’t promise anything. I have been a fan of Vytauras Sasnaukas’ pizza for a while. 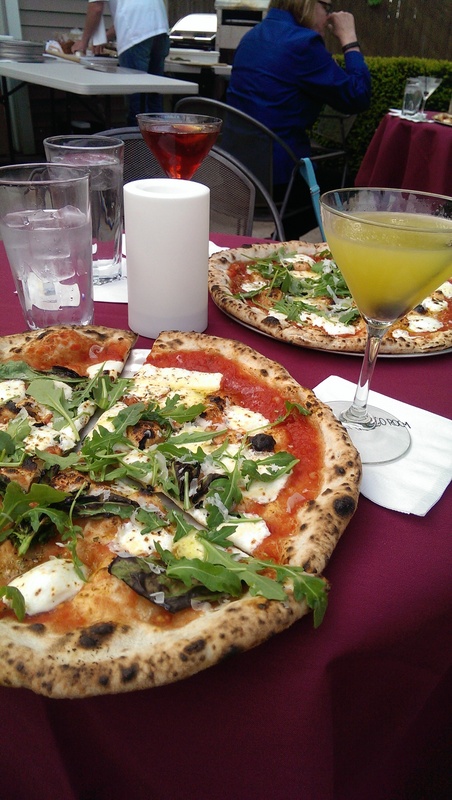 I had been hearing about his pizzas back when my friends would gather on the patio at Americano for pizza night. When Americano closed and before Citizen Pie was born, he did some pop-up pizza nights in a gas-fired pizza oven at The Velvet Tango Room, where he started conceiving plans with Claudia Young and Paulius Nasvytis. He got his start making pizzas when he was growing up in Lithuania (his story is really interesting and worth a read) and has been experimenting with various fermented doughs for a while now. His dough really makes his pizzas stand out from the crowd! 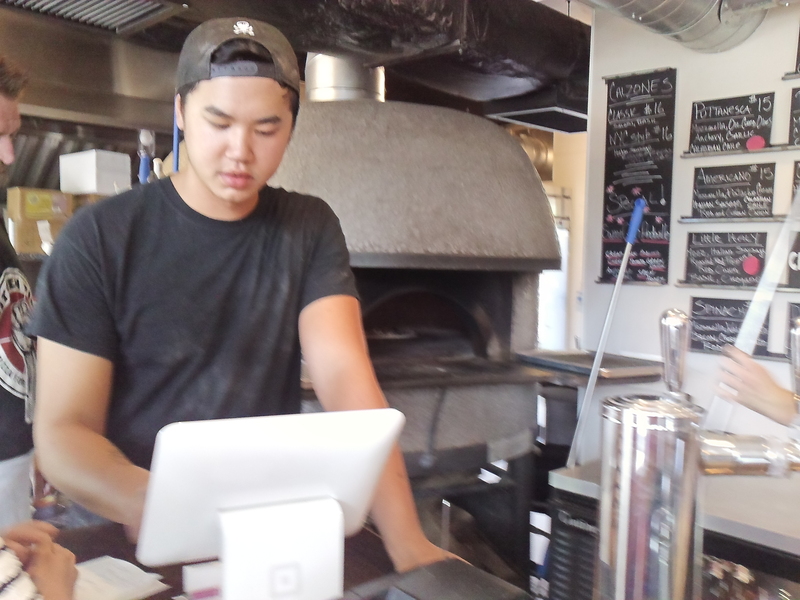 He bought a wood-fired brick oven and opened Citizen Pie in the Waterloo District across from the Beachland Ballroom. 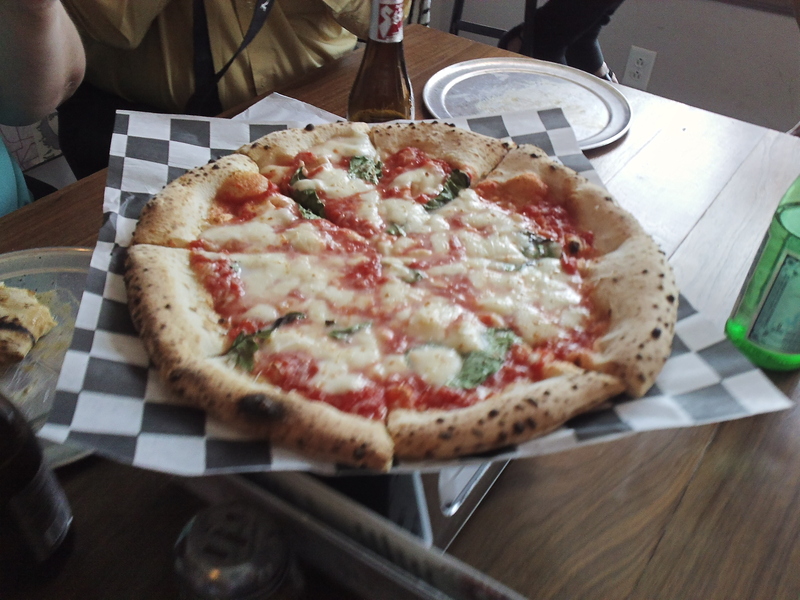 Citizen Pie makes napolitano pizzas and is definitely one of the best pizza places in Cleveland. The pizzas come out fast and hot. They aren’t laden with toppings. There is just the perfect balance for a taste explosion. 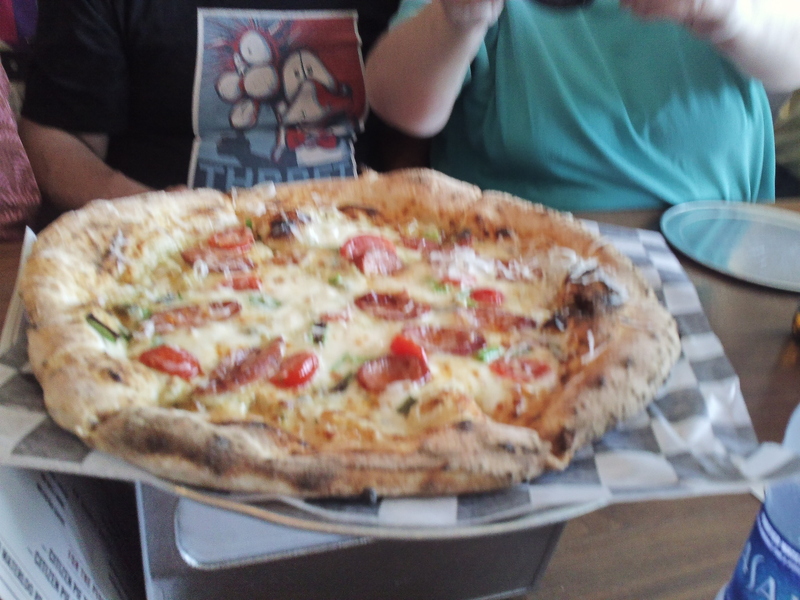 I recently met some folks at Citizen Pie to try their Summer pizza special, which featured sweet Ohio corn and poblano cream, Andouille sausage, cherry tomatoes, and green onion finished with a spicy honey drizzle. This pizza was absolutely out of this world. The thing I like most about the pie was the corn cream balanced with the honey drizzle. It was just a great pizza. My second favorite was the Cacio e Pepe pizza, which is topped with mozzarella, pecorino and straciatella cheese, garlic, black pepper and basil. It is a very simple pizza, but it explodes with flavor. I can’t wait to have it again. 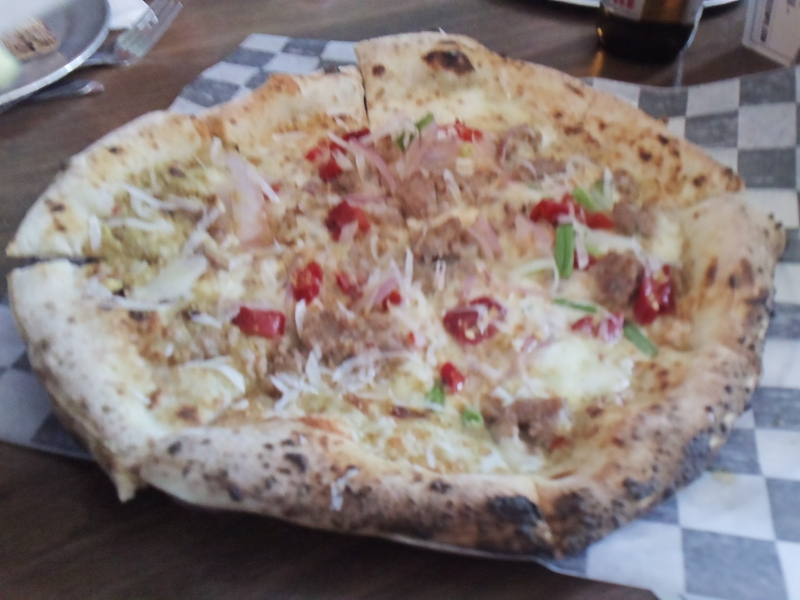 I had been wanting to try the Americano pizza for a while as well. Named after V’s Bratenahl restaurant Americano, the Americano features mozzarella, pistachio cream, Italian sausage, red and green onion and Calabrian chiles. It has a bit of a kick to it, but I love the idea of pistachio cream and it goes really well with the sausage. The mushroom pizza is also a crowd-pleasure. 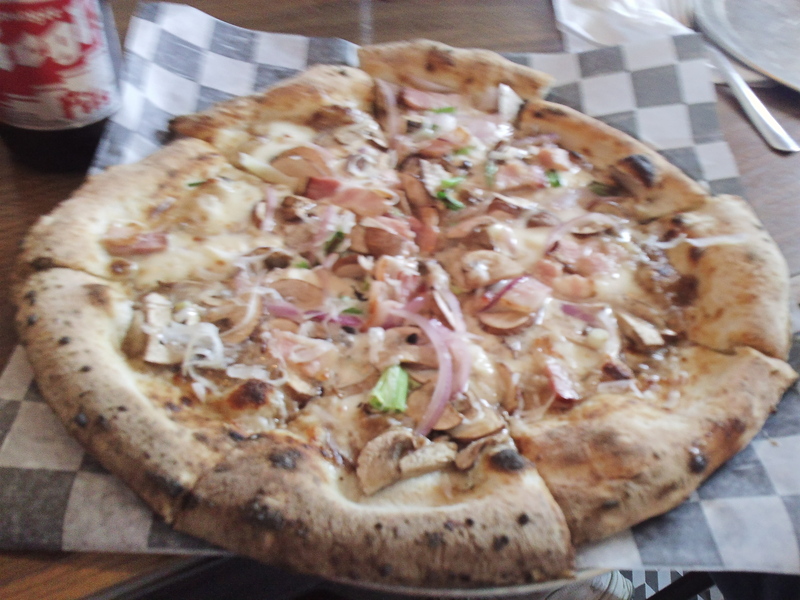 It is topped with mozzarella, brie, porcini duxelles, bacon, red onion and truffle oil. I love mushrooms and brie, and the truffle oil was not as off-putting as I usually find it. Again, it is just a well-balanced pie. I took a piece of this one home to enjoy later that night. One of the group ordered a Tartufo, which I was familiar with from the Italian restaurants in Germany. It is a ball of frozen dark chocolate with rum and amarena cherry. As you can imagine, it is delicious. We passed it around the table, and everyone swooned. Claudia is also known for her Migliaccio, which is a ricotta cheesecake with lemon, orange and vanilla. She worked hard to come up with the perfect cheesecake, which Michael Ruhlman has raved about. 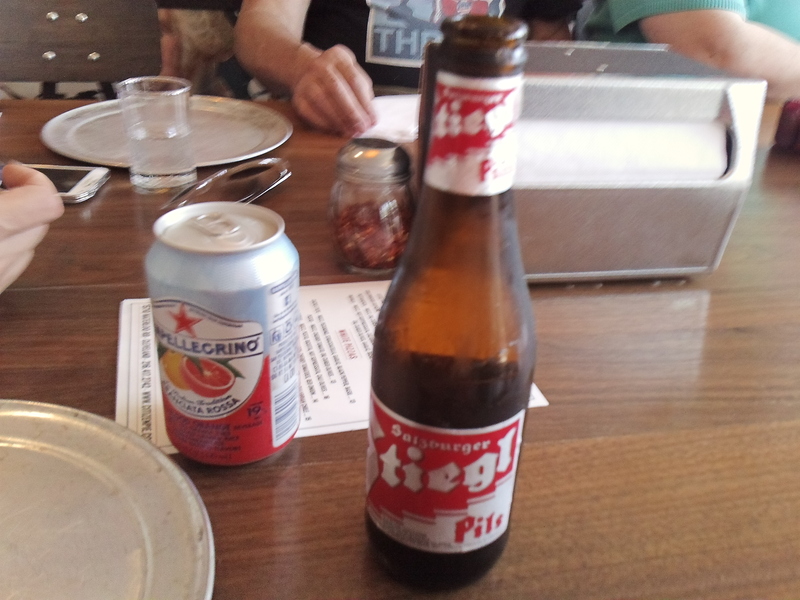 I was also extremely excited to see that they serve Stiegl beer here. Stiegl is brewed in Salzburg, Austria and the monks have been brewing it there since 1492. It is a nice smooth lager and goes very nicely with the pizza. I was also pleased to see San Pellegrino, Illy espresso drinks and cane sugar Coca Cola. It’s the little touches like that that just impress me. Chef V is constantly coming up with new and exciting pizza ideas, like a recent eggs benedict pizza. So if you like good pizza be sure to make a trip to Citizen Pie. They will be opening a second location in Ohio City in the near future – bringing Pizza to the People.